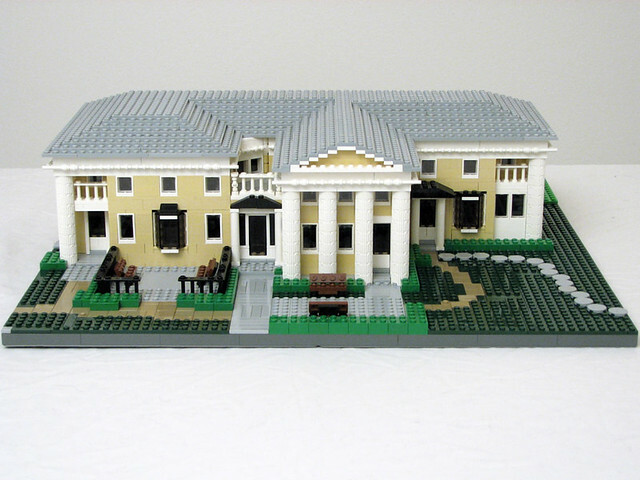 Brick Town Talk: 3rd Street Style - LEGO Town, Architecture, Building Tips, Inspiration Ideas, and more! Geneva, Illinois- (BTT) Not all historical homes can be as famous as Fallingwater, or the Robie house, or even the Villa Savoye. But lack of fame does not mean lack of interest. This beautiful rendition of the Charles B. Wells house, built for a NILTC meeting by Matt de Lanoy (Pepa Quinn) has its share of nice details, like the recessed, angled balcony wall, cast iron window coverings, and stone pathway. The house takes up an entire city block in real life, and the model doesn't disappoint in minifig scale!